There is nothing as dramatic as a large piece of art. 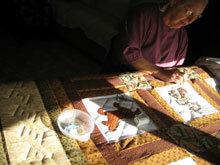 It is the sheer size, combined with the painstaking detail, that makes the Applique Amish Quilt have such an impact. Usually depicting scenes from nature, the Amish Quilter paints a floral display of vibrant art, using her needle to hand quilt stitches and trails, thereby bringing her art to life. An Applique Amish Quilt makes an attractive focal point for your room, and can transform the ordinary into a showcase of detail and delight.